OAKLAND, Calif. — Out on the hardwood, toward a far corner of the gym, crouches a 70-year-old man, thin and bespectacled, with a crook in his back, a hitch in his step and braces on his wrists to protect them from bullet passes. 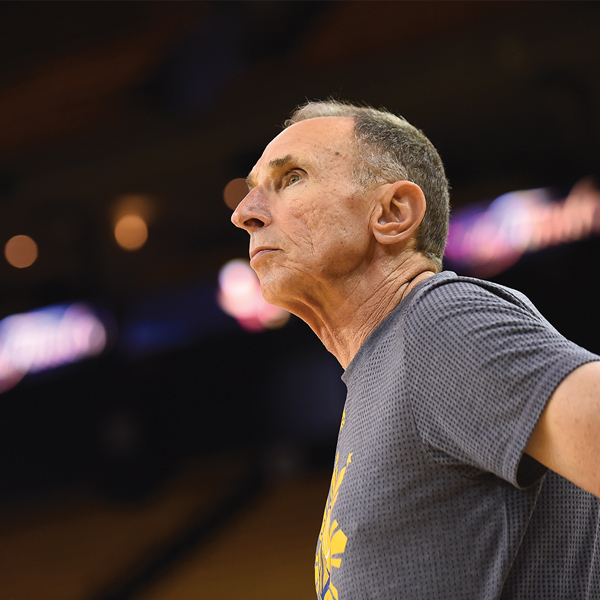 He is drilling a quartet of Golden State Warriors, each young enough to be his grandson. Adams was in his mid-60s when Kerr, the Warriors’ head coach, hired him away from the Boston Celtics, where he was the lead assistant coach. What Kerr wanted was a venerable wise man, someone who had coached for decades but had no real desire to be promoted. Someone who would thus be free to speak his mind — like Tex Winter, who was Phil Jackson’s assistant in the 1990s when Kerr starred on the Chicago Bulls’ championship-winning teams. In the summer of 2014, Kerr took Adams to dinner at A16, a trendy, red-brick restaurant in Oakland. Adams, who reads literature and poetry and likes fine wine, ordered a bottle of pinot noir for the table. The waiter poured a bit for him to try. He swirled it in his glass and took a sip. “That tastes nothing like a pinot,” he said, insisting the waiter bring another bottle. “I wanted a truth-teller, somebody to tell me, ‘You gotta do this, and you gotta do that,’ completely unfiltered,” Kerr says. “Somebody whose experience and wisdom made everyone stand up and listen. I knew right then that we were talking to the right guy, and I’m just thankful we have him because he’s been instrumental in all that we’ve done.